Rand McNally | The Best Mardi Gras Celebrations Across the U.S. This town of fewer than 500,000 people is actually home to the country’s oldest official Mardi Gras celebration. Since 1703, when the French arrived on the eve of the holiday, this Gulf Coast city has been partying in the streets with dozens of parades and colorful floats to celebrate during the weeks leading up to Fat Tuesday. 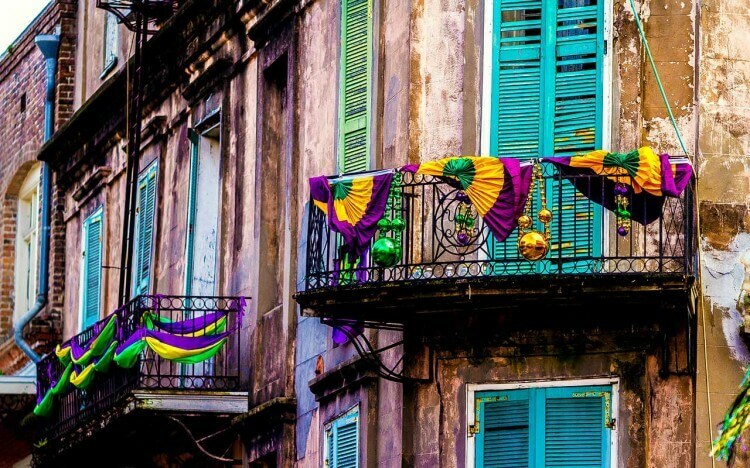 Nearly a million people flock to this city every year to revel in the elaborate parties - so be sure to stake out your spot early to catch the flying beads, moon pies, and other fun trinkets being thrown from the floats. St. Louis boasts the largest Mardi Gras celebration in the country outside of New Orleans. For weeks, special events and parades consume the city and provide endless fun for everyone. While the main event is the Bud Light Grand Parade which draws tens of thousands of people, there are plenty of other events that are not to be missed. The Beggin’ Pet Parade holds the Guinness World Record for the largest costumed pet parade where thousands of pets hit the streets to strut their best Mardi Gras styles. Other fun events include The Weiner Dog Derby, the longest-running dachshund derby in America, a Cajun cook-off, a 5K, and a family winter carnival. While the northwest might not be known for their Mardi Gras celebrations – that doesn’t stop Portland from honoring the tradition. Each year they have a massive ticketed themed ball and a free parade down Mississippi Avenue featuring. Marching bands, hand-decorated umbrellas thrown from the floats, and costume contests are sure to provide entertainment for all-ages. The annual Pensacola Grand Mardi Gras Parade is the largest parade in Pensacola and is the largest gathering of people downtown during the entire year. With 6,000 participants and more than 100,000 attendees, you can really feel the magic of the celebration. Green, purple, and gold are a colorful backdrop to the pristine white beaches of the island where family fun abounds. If you want a unique Mardi Gras experience head to Galveston Island for the country’s 3rd largest celebration and enjoy all the festivities while feeling the sand between your toes. Lavish parades and parties take over the island between February 2nd and 13th and draws more than 350,000 attendees. Enjoy 30+ concerts, 24 parades, 20 balcony parties, several balls, and more. You can really see the city come to life with infectious revelry during this exciting time. For one of the biggest east coast Mardi Gras celebrations, look no further than Folly Beach. The town turns up en masse and heads to Center Street for beads, booze, music, and food for what is better known as “FollyGras.” Enjoy New Orleans-style food and drink at local bars and restaurants – but what you really don’t want to miss is the parade. As the crown jewel of the festival, the parade is filled with bright costumes, live music, face painting, and so much more. So come with party spirit in tow and let the good times roll. While many cities celebrate Mardi Gras, no one does it quite like New Orleans. The Big Easy hosts one of the most iconic and colorful celebrations in the world with parades and parties happening in every neighborhood. You can expect vibrant floats, masked performers, live music, and more as thousands head to the streets for the festival that never seems to slow down. So throw on a wild costume, catch some beads, be careful, and embrace the joyous chaos that is this epic Mardi Gras celebration.